Once again, I was honoured to be a part of the JQ Fitness Charity Boot Camp. This huge group fitness event was organized to raise funds for Free_Them who are working towards a goal to end human trafficking. This was my second year volunteering at the event with the help of my husband, Perry. I baked my heart out for the week prior to the event and then Perry helped me to man the food and beverage tables along with Liz, another lovely volunteer. This is table with my assortment of baked goods. The coffee and baked goods donated by Starbucks. One lovely volunteer stayed up very late boiling all those eggs and another got up really early to cut up oranges! I’m happy to say I had lots (and lots and lots) of requests for my recipes. Since I made a few favourites, some of the recipes were already posted after last year’s event so you can check them out here. Dehydrated Fruit and Nut Cookies. Another item the boot campers seemed to enjoy was the banana chocolate chip muffin tops. Banana Chocolate Chip Muffin Tops. This was a remake of a recipe I’ve been making for some time. I usually make it into a banana bread, but decided these would be easier to handle than slices would. So I changed it slightly to make the batter more pourable. I doubled it, using 7 bananas and 5 eggs. I also added chopped stevia-sweetened chocolate and used less cinnamon and nutmeg. I baked it in a muffin top/whoopie pan for 25 minutes at 375F. You can check out the original recipe here. These Maple, Flax & Chia Cookies were a big hit with the kids. Preheat oven to 350F (180C). Line a cookie sheet with parchment paper. In the bowl of a food processor, blend the oats until they resemble a coarse meal. Add the coconut oil, maple syrup and ground flax seeds. Blend until combined well and smooth. Set aside for at least 2 minutes. Put all of this into a large bowl and add the rest of the ingredients. Stir well. Using a teaspoon-sized cookie scooper (or 2 teaspoons), drop the mixture onto cookie sheet about 2 inches (5 cm) apart. Do not flatten the cookies as they will spread on their own. Bake 10-13 minutes, until slighlty puffed and lightly browned. Allow to cool completely before removing from sheet (they will firm up as they cool). Makes 8-10 cookies. May be frozen. I love these Oatmeal Spice Cookies because of the crunch. I know some people love a soft, gooey cookie, but for me it’s all about the crunch. These are incredibly easy to put together and cook up so quickly using ingredients most of us have on hand. They’re the perfect thing to make when someone calls to say they’re dropping by. In a pinch, you could sub. brown sugar for the coconut palm sugar although I’d recommend replacing your brown sugar with coconut palm sugar all the time because of its lower glycemic load. Preheat oven to 350F. In a large bowl, mix all ingredients until well-combined. Dollop by teaspoonfuls onto parchment-lined cookie sheets. Bake for 15 minutes and then allow to cool on cookie sheets for a few minutes. Remove to cooling trays to firm up. These Seed Cookies are my favourite healthful cookie. I love these Seed Cookies as they’re almost like a meal in themselves. I find a couple of these can keep me going for hours. They’re full of some really great ingredients like antioxidant-packed raw cacao nibs and protein-packed pumpkin seeds. Not to mention they taste pretty darn yummy. Preheat oven to 350F. In a large bowl, mix all ingredients together until well-combined. Onto 2 parchment-lined cookie sheets, dollop mixture using a tablespoon-sized cookie scooper. There’s no need to leave space between cookies as they do not spread. Bake for 16 minutes, rotating trays halfway through baking time. Remove to wire cooling trays and enjoy. A new (and popular) addition this year were these sweet and crispy sesame cookies. These are also filled with good-for-you ingredients like calcium-rich sesame seeds, organic eggs and ground almonds. I’m going to keep this recipe to myself for now as it’s one I plan to demonstrate in my Healthful Treats Workshop. I’m still ironing out the details of these workshops but please stay tuned as I’ll be making an announcement about the dates, times and costs very soon. There was a photo booth! And lots of dressing up in cute outfits. There were free massages and I can vouch that they were great. I received mine from the wonderful Erynne Williams, RMT. This is the Free_Them booth. These lovely ladies were selling raffle tickets for some pretty sweet prizes like court-side basketball tickets!! These were this year’s swag bags and they were filled with amazing goodies. On Saturday (yesterday) morning I was privileged to be a part of a wonderful charity event. 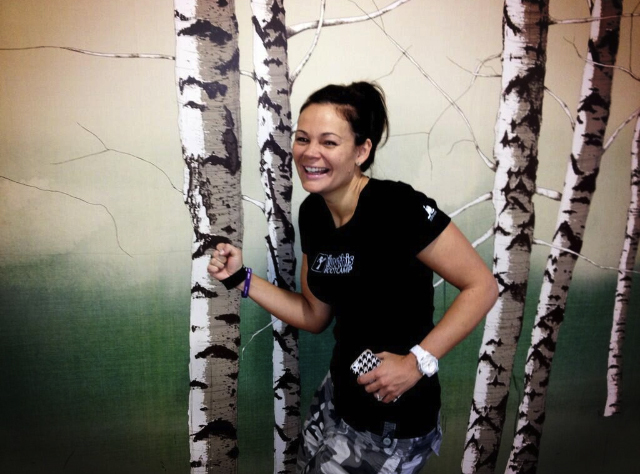 Pictured above is the lovely Johanna, owner and founder of JQ Fitness. Johanna, her husband Jeff and their team at I Luv This Bootcamp have been working around the clock to make yesterday‘s event a reality. All proceeds from this charity bootcamp were donated to Free-them which is an organization working towards a goal to end human trafficking/slavery. I decided that rather than paying to participate in the boot camp portion of the day, I would like to do a little more to help out. I approached Johanna a couple of months ago and asked if I could provide some healthy baked goods for the participants to enjoy before and after their workout. She accepted my offer, so over the next few weeks I made some treats and had the members of our kickboxing and stability ball classes (taught by Johanna) give me some feedback. I’m happy to say that the comments were all positive and everyone seemed to enjoy being my lab rats 🙂 So for the past week, I’ve been baking and dehydrating my heart out to provide plenty of goodies to help fuel and replenish the participants of the event. The day went off without a hitch (as far as I know) and was a great success. Lots of money was raised for this wonderful cause and a whole lot of fun was had doing so. I’m very happy to say that I got more compliments than I could ever have dreamed of and countless requests for recipes. So, I promised I’d get working on a blog post about the event and that I would share the recipes for what I baked and dehydrated. Among the contents was One Coconut Water, Awake caffeinated chocolate, a $30 gift card towards boot camp classes and many other goodies. And there was even a kiddie boot camp 🙂 …. And now for the recipes as promised. I have already blogged about the seed cookies here (but changed them slightly) and the oatmeal spice cookies here and unfortunately I don’t have my own pics. of the other goodies (yet) except for the chocolate zucchini bread as I didn’t even think of that. However, I’ll share all the recipes below and hopefully will get around to baking these items again so that I can show the step-by-step processes. Not all of these recipes were invented by me, so I’ll also share links to the originals. Here is where I found the original recipe for the zucchini bread. This is the recipe, including my changes. Grate zucchini on the large holes of a cheese grater. Lay paper towels on your kitchen counter, put zucchini on top and cover with more paper towels. Press down to remove moisture and then put the zucchini into a large bowl. Add the rest of the ingredients and mix until well-combined. Line 2 small (3″ x 5″) loaf pans with parchment paper and bake for 35-40 minutes until the tops spring back when gently pressed. Allow to sit for 5 minutes in the pans, then remove to a cooling rack until cooled through. Add the coconut oil, maple syrupand ground flax seeds. Blend until combined well and smooth. Set aside for at least 2 minutes. The little coconut balls are actually a raw recipe from Sarmathe owner of Pure Food and Wine which is a restaurant we plan to visit one day. This recipe was e-mailed to me, so I don‘t have a link for it. Hopefully mentioning the author here is giving enough credit! Mix all ingredients together. Using a teaspoon-sized cookie scooper, place mounds on the mesh trays of a dehydrator. The original said to dehydrate for 12-24 hours at 115F. I did it at 125F for about 4-6 hours and that was plenty. I’m sure you could do these on cookie sheets in the oven at its lowest setting with the door slightly ajar. Because the lowest oven temp. is probably higher than 125F, it would most likely only take 3 hours or so.